BACKGROUND: Nutrition interventions can alleviate the burden of malnutrition by improving patient outcomes; however, evidence on the economic impact of medical nutrition intervention remains limited. A previously published nutrition-focused quality improvement program targeting malnourished hospitalized patients showed that screening patients with a validated screening tool at admission, rapidly administering oral nutritional supplements, and educating patients on supplement adherence result in significant reductions in 30-day unplanned readmissions and hospital length of stay. OBJECTIVES: To assess the potential cost-savings associated with decreased 30-day readmissions and hospital length of stay in malnourished inpatients through a nutrition-focused quality improvement program using a web-based budget impact model, and to demonstrate the clinical and fiscal value of the intervention. 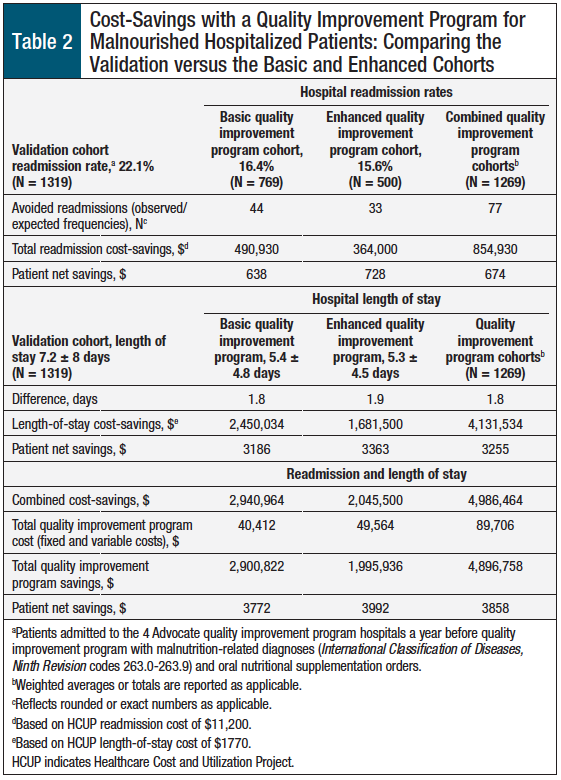 METHODS: The reduction in readmission rate and length of stay for 1269 patients enrolled in the quality improvement program (between October 13, 2014, and April 2, 2015) were compared with the pre–quality improvement program baseline and validation cohorts (4611 patients vs 1319 patients, respectively) to calculate potential cost-savings as well as to inform the design of the budget impact model. Readmission rate and length-of-stay reductions were calculated by determining the change from baseline to post–quality improvement program as well as the difference between the validation cohort and the post–quality improvement program, respectively. RESULTS: As a result of improved health outcomes for the treated patients, the nutrition-focused quality improvement program led to a reduction in 30-day hospital readmissions and length of stay. The avoided hospital readmissions and reduced number of days in the hospital for the patients in the quality improvement program resulted in cost-savings of $1,902,933 versus the pre–quality improvement program baseline cohort, and $4,896,758 versus the pre–quality improvement program in the validation cohort. When these costs were assessed across the entire patient population enrolled in the quality improvement program, per-patient net savings of $1499 when using the baseline cohort as the comparator and savings per patient treated of $3858 when using the validated cohort as the comparator were achieved. CONCLUSION: The nutrition-focused quality improvement program reduced the per-patient healthcare costs by avoiding 30-day readmissions and through reduced length of hospital stay. These clinical and economic outcomes provide a rationale for merging patient care and financial modeling to advance the delivery of value-based medicine in a malnourished hospitalized population. 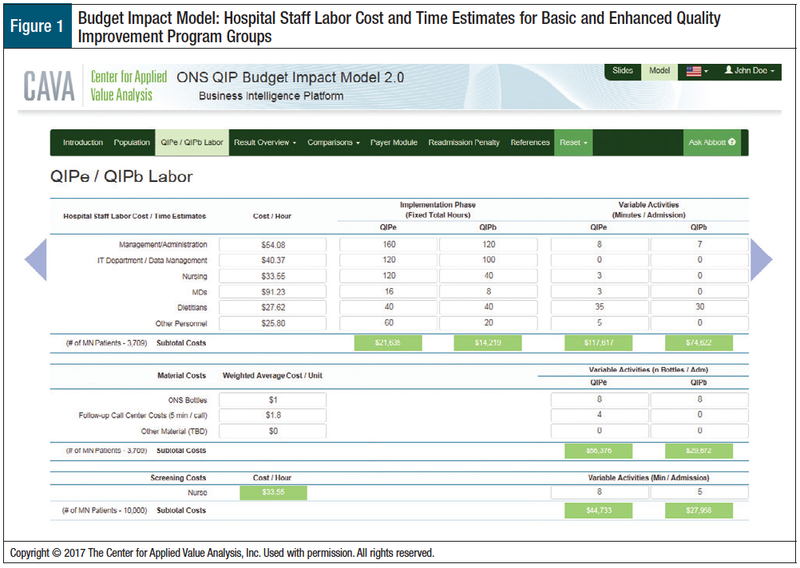 The use of a novel web-based budget impact model supports the integration of comparative effectiveness analytics and healthcare resource management in the hospital setting to provide optimal quality of care at a reduced overall cost. Nutrition interventions (eg, comprehensive malnutrition screening, oral nutritional supplementation, patient and caregiver education, and discharge nutrition planning) alleviate a significant degree of patient health and economic burden resulting from malnutrition.8-12 However, health-related economic outcomes have not been extensively studied in the field of medical nutrition.13 Hence, the utility of medical nutrition as a driver of value-based medicine has largely remained overlooked and underappreciated as a means of improving cost-savings at the hospital level as well as the integrated delivery network. Given the current environment of value-based medicine as an important pathway to improving clinical outcomes for patients and for healthcare systems, Advocate Health Care (hereafter, “Advocate”), a large accountable care organization, explored the impact of nutritional intervention, using a comprehensive quality improvement program, on health and economic outcomes of hospitalized malnourished patients. 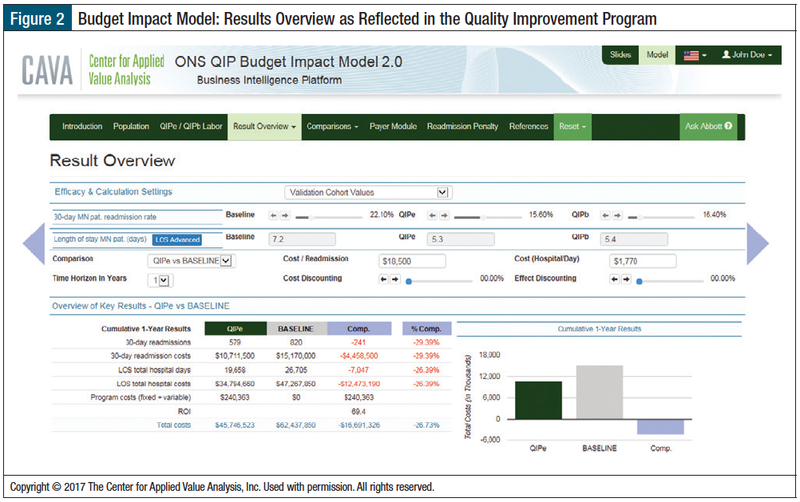 To analyze the cost implications of the clinical findings generated by the nutrition-focused quality improvement program,14 we developed a web-based budget impact model based on the Advocate-generated quality improvement program data. The objective of this model was to evaluate whether, and to what degree, an applied nutritional intervention can result in significant cost-savings as a result of clinical improvements of patients at the hospital and the integrated delivery network. The quality improvement program methodology and implementation has been outlined by Sriram and colleagues in a previous publication in the Journal of Parenteral and Enteral Nutrition.14 In summary, the quality improvement program included malnutrition risk screening at admission, prompt initiation of oral nutritional supplementation for at-risk patients, and nutrition support and education for patients during the hospital stay and postdischarge. A 2-group, pre-post study of malnourished adults—International Classification of Diseases, Ninth Revision (ICD-9) codes 263.0-263.9—from any diagnosis category was conducted at 4 Advocate hospitals: the basic quality improvement program was implemented at 2 hospitals, and the enhanced quality improvement program was implemented at 2 other hospitals. Each quality improvement program group included 1 teaching hospital and 1 community hospital. The teaching and community hospitals in the basic quality improvement program group had 749 beds and 273 beds, respectively. The teaching and community hospitals in the enhanced quality improvement program group had 638 beds and 176 beds, respectively. All the hospitals were located in the suburbs of Chicago, IL. At the basic quality improvement hospitals, nurses screened all patients at admission using an electronic medical record (EMR)-cued malnutrition screening tool,15 and oral nutritional supplementation was provided within 24 to 48 hours to patients with scores of ≥2 on a malnutrition screening tool. Patients at the enhanced quality improvement program hospitals were also screened using the malnutrition screening tool; those with scores of ≥2 received nutritional supplementation within 24 hours, inpatient nutrition education, postdischarge nutrition instructions, follow-up telephone calls, and discount coupons for retail oral nutritional supplementation purchases. The primary outcome was 30-day unplanned readmission, and the secondary outcome was the hospital length of stay. The quality improvement program took place between October 13, 2014, and April 2, 2015 (a 6-month period). The enhanced and basic quality improvement program groups were compared with a baseline patient cohort defined as patients with a malnutrition diagnosis and orders for oral nutritional supplementation placed in the EMR by a nurse, a registered dietitian, or a physician between January 1, 2013, and December 31, 2013, at 8 eligible Advocate hospitals. Hospital data were used to determine the baseline readmission rate of eligible patients and to inform other quality improvement program methodologic requirements. The basic and enhanced quality improvement programs’ results were also compared with a validation cohort of patients with a malnutrition diagnosis and oral nutritional supplementation orders between October 13, 2013, and April 2, 2014, at the 4 quality improvement program hospitals. The 8 eligible hospitals were evaluated for the suitability of their quality improvement program implementation; of these, 4 hospitals were selected for the study. The selection of 2 basic quality improvement program hospitals and 2 enhanced quality improvement program hospitals was based on similar demographic and clinical characteristics of patients and hospitals, including annual admissions rate, average patient age, length of hospitalization, race, and historic all-cause 30-day readmission rates. This budget impact model is based on data from 1269 patients in the Advocate quality improvement program compared with the pre–quality improvement program baseline and validation data. The model’s purpose is to assess the budget impact of quality improvement program implementation from the hospital and integrated delivery network perspectives. The model calculates the 30-day readmission rate reduction among the total hospital-specific malnourished patient population, the mean length-of-stay reduction among that same population, and the associated total cost reductions. These outputs are simulated based on the quality improvement program study outcomes for the basic and enhanced quality improvement program cohorts, compared with baseline, and compared with the validation cohort. The model enables predictive outcome simulations (30-day readmissions and mean length-of-stay reductions) for a time horizon between 1 and 5 years, as well as the flexible comparison of all simulated alternatives. Throughout this article, static representations reflect the cost results calculated via a dynamic model. The model is designed to be customizable for an individual hospital or integrated delivery network with multiple inputs that can be user-defined. However, to facilitate the model’s use, most of these variables are prepopulated with nationally representative data. 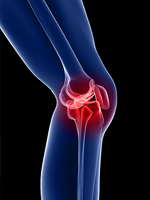 The only required input to the model is the number of hospital admissions annually. From this data point, the model estimates the hospital-specific malnourished patient population to assist institutions that do not have an accurate estimate of their proportion of malnourished patients. The percentage of patients with specific malnutrition-related morbidities (based on US estimates published by Pfuntner and colleagues20) and the percentage of malnourished patients by disease (based on data published by Norman and colleagues21 and Lim and colleagues22) are programmed into the model as assumptions to determine the hospital-specific malnourished patient population. Of note, the model is intended to provide hospitals that do not have the necessary patient data—a data deficiency that is common to many US hospitals—with referenced, nationally benchmarked proxy data from which to estimate the prospective impact of a quality improvement program at their institutions. Furthermore, the proxy data can be adjusted in the model between a hospital’s upper and lower bounds to ensure maximum relevance by the hospital itself. The fixed and variable costs of the enhanced and basic quality improvement programs were estimated on the basis of specific Advocate hospital staff time that was recorded for the implementation of the quality improvement program (mainly Information Technology staff who modified the EMR to support the quality improvement program), screening and diagnosing patients (eg, nurses, registered dietitians), and the associated hourly wage rates for these staff as reported by the Bureau of Labor Statistics in 2014.23 In addition, the oral nutritional supplementation material costs (ie, cost per bottle) and the cost of postdischarge telephone follow-up were included (applied to the enhanced quality improvement program only; Figure 1). The average cost of $1770 per hospital day and $11,200 for readmission was selected using HCUP cost data reported for adults (age range, 18 to ≥65 years) with malnutrition-related diagnoses (ICD-9 codes 263.0-263.9) using 2013 data for US hospital admissions.7 Specifically, the $1770 cost is based on calculations of re­admission cost data reported in the National Inpatient Sample database, whereas the $11,200 cost figure is based on cost data calculations reported in the Nationwide Readmissions database. The National Inpatient Sample contains data to support various types of analyses of national readmission rates for all payers and the uninsured, whereas the Nationwide Readmissions Database contains data on more than 7 million hospital stays annually. The cost data were presented in a descriptive manner for each quality improvement program group compared with the pre-program baseline and validation cohorts. The baseline cohort included 4611 patients who were admitted to 8 Advocate hospitals in 2013 and were used to estimate the baseline readmission rate for patients with malnutrition-related diagnoses and oral nutritional supplementation orders. This cohort was derived before the implementation of the quality improvement program and was used to set the study parameters. To calculate the percent reductions (also referred to as “avoided readmissions”) for the 30-day readmission rate comparisons between the baseline cohort and the quality improvement program cohort, and between the validation cohort and the quality improvement program cohort, we used frequency distribution analysis to test for deviations of the observed frequencies from the expected frequencies. To determine the difference in days for the pursued comparisons between the baseline cohort and the quality improvement program cohort, and between the validation cohort and the quality improvement program cohort, the inpatient average hospital days reported for the different groups were subtracted. A sensitivity analysis was performed to determine whether the cost findings were consistent when looking at 30%, 40%, and 50% malnutrition prevalence rates in accordance with the current literature on malnutrition prevalence.16-19,21,24 All analyses were calculated using the web-based budget impact model (Figure 2). 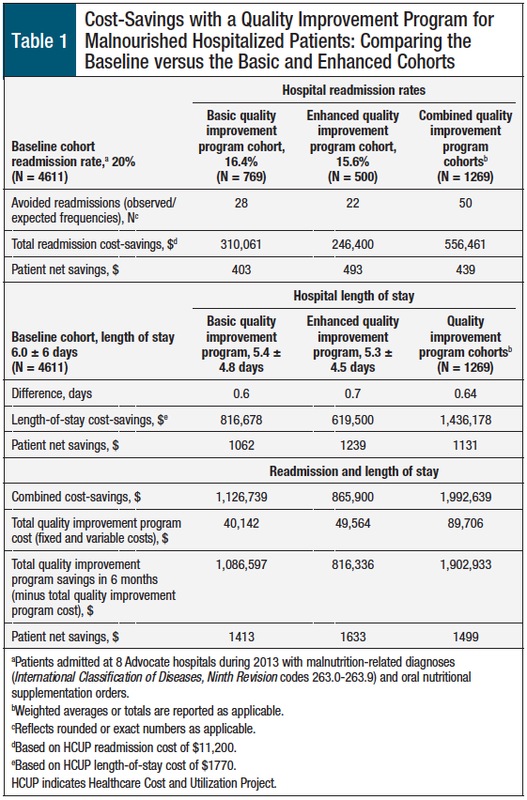 Table 1 and Table 2 outline the cost-savings associated with significant reductions in relative readmission rates and hospital length of stay after the quality improvement program. Table 1 lists the cost-savings associated with reduced readmission rates and length of stay, by group, comparing the baseline cohort (between January 2013 and December 2013) and the basic and enhanced quality improvement program cohorts during the course of the program (between October 2014 and April 2015). Table 2 lists the cost-savings associated with reduced readmission rates and length of stay, by group, comparing the validation cohort (between October 2013 and April 2014) with the basic and enhanced quality improvement program cohorts during the course of the program (between October 2014 and April 2015). When comparing the basic and enhanced quality improvement program groups with the baseline cohort before the program using the average readmission cost of $11,200, the total cost-savings resulting from avoided readmissions were $310,061 (–18% among 769 patients in the basic quality improvement program) and $246,400 (–22% among 500 patients in the enhanced quality improvement program), respectively. 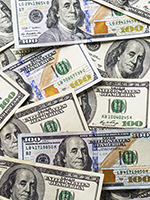 The net savings from avoided readmissions per patient treated was $403 for the basic quality improvement program and $493 for the enhanced quality improvement program, respectively. For the combined program cohorts, the total cost-savings resulting from avoided readmissions was $556,461 and the patient net savings was $439 per patient treated (Table 1). When the quality improvement program results were compared with those of the pre-program validation cohort, the total basic quality improvement program cost-savings resulting from avoided readmissions were $490,930 (–25.8%) for the basic quality improvement program and $364,000 (–29.4%) for the enhanced quality improvement program, and the patient net savings from avoided readmissions were $638 and $728, respectively. For the combined quality improvement program cohorts, the total cost-savings resulting from avoided readmissions was $854,930, and the patient net savings was $674 per patient treated (Table 2). When comparing the 2 quality improvement program groups to the pre-program baseline cohort, using the average hospital day cost of $1770, the total cost-savings resulting from the reduced length of stay were $816,678 (0.6-day reduction among 769 patients) for the basic program and $619,500 (0.7-day reduction among 500 patients) for the enhanced program. The net savings per patient treated resulting from the reduced length of stay was $1062 for the basic program and $1239 for the enhanced program, respectively. For the combined quality improvement program cohorts, the total cost-savings resulting from reduced length of stay was $1,436,178, and the patient net savings was $1131 per patient treated (Table 1). When the quality improvement program results were compared with those of the pre-program validation cohort, the total cost-savings resulting from reduced length of stay was $2,450,034 (–1.8 day) for the basic program and $1,681,500 (–1.9 day) for the enhanced program, and the patient net savings resulting from reduced length of stay were $3186 and $3363, respectively. For the combined quality improvement program cohorts, the total cost-savings from the reduced length of stay was $4,131,534, and the patient net savings was $3255 per patient treated (Table 2). The cost-savings resulting from 30-day reduced readmissions and length of stay were $1,902,933 compared with the pre-program baseline cohort, and $4,896,758 compared with the pre-program validation cohort. The patient net savings were $1499 and $3858 per patient treated, respectively (Tables 1 and 2). The results of the sensitivity analysis coincided with the original findings when the prevalence of malnutrition was set at 50%. Significant cost-savings were observed for the 2 quality improvement program groups in relation to a prevalence of malnutrition of 30% and 40% when using the validation cohort as the comparator. Specifically, the total cost-savings were $2,910,334 with a 30% malnutrition prevalence and $3,907,103 with a 40% malnutrition prevalence. In addition, consistent with the main analysis, higher total cost-savings was observed in the basic quality improvement program group, whereas higher patient net savings was observed in the enhanced quality improvement program group. The adoption of good nutrition practices (such as the basic and enhanced quality improvement programs) in the inpatient setting was shown to produce significant cost-savings as a result of avoiding unnecessary 30-day readmissions and reducing the length of stay among malnourished hospitalized patients. Although significant cost-savings were noted for the basic and enhanced quality improvement program groups, it is important to highlight that with the augmentation of the additional interventions as noted for the enhanced quality improvement program, an increased cost-savings was seen among this group of patients, estimated at $220 per patient per stay. This is an insight that merits further investigation, which could help to better assess the cost-effectiveness of each of the quality improvement program components. The most recent statistical brief of HCUP 2013 data concluded that the resulting cost of a readmission for malnourished patients is almost as high as $17,000 per patient,27 thereby providing support for the use of the figure from Philipson and colleagues ($18,478) as the upper bound to the cost estimate in our model. As a result, because the quality improvement program patient population in our analysis is very similar to that of the analysis by Philipson and colleagues, total cost-savings of up to $5,452,309 and patient net savings of up to $4295 would be observed from the reduced 30-day readmissions and lengths of stay over a 6-month period. If annualized, the total cost-savings would be $10,904,618. These numbers are derived by replacing the lower-bound HCUP readmission value of $11,200 with the upper-bound Philipson value of $18,478, which are calculated using the identical methodology illustrated in Tables 1 and 2. These savings help hospitals and integrated delivery networks, such as Advocate, to optimize their financial performance and to establish value-driven changes in cost management. The purpose of this study was to assess the effect of a quality improvement program from a hospital and an integrated delivery network perspective rather than from a societal perspective. Nevertheless, the observed results highlight the importance of building on these facility­specific findings, and suggest the value of conducting future nutritional studies from a societal perspective, which may identify significant economic, clinical, and social benefits. This study is unique in that it is the first to assess the impact of a novel nutrition-focused quality improvement program together with the design of a budget impact model that supports integration of comparative effectiveness modeling and healthcare resource management in the hospital setting. This study has several limitations. First, because this study focused on a population-based management intervention, individual-level cost data were not collected. The scope of this project was not to assess the impact of the integrated delivery network on episode cost data but on cost-savings that a population-based management approach to nutrition in the acute care setting may produce as a result of the reduced 30-day readmission rates and hospital length of stay. Second, this model does not account for variability in program fidelity that could attenuate the effects on outcomes and costs beyond the 6-month integrated delivery network study period. Third, our calculations reflect the 2013 costs for readmission and length of stay, and the 2014 employment wages; hence, costs in more recent periods may be needed. However, it is important to note that labor- and state-specific cost figures will not be significantly different from the ones used in our analysis. Fourth, the model examines the clinical and economic impact at only 1 healthcare system/integrated delivery network. Therefore, the results at other hospitals and systems may produce varying results. Finally, this is an observational, real-world pre-post integrated delivery network study design that does not allow assessment of causality or provide for sufficient control for different temporal confounders (eg, change in patient mixes) that could influence the readmission and length-of-stay improvements observed, which could result in higher or lower cost-savings. Although these limitations are worth considering, the model nevertheless enables providers, administrators, and payers to appreciate how a nutrition-focused quality improvement program can deliver significant clinical and economic improvements. The results of this study support the idea of elevating the role of nutritional care and related interventions in advancing value-based medicine in population-based management. The study underscores how proper inpatient nutrition care, although frequently ignored by providers, healthcare administrators, and payers as an important aspect of healthcare delivery, is nevertheless clinically and economically significant at the facility and integrated delivery network levels. Future research is needed to better understand the cost-effectiveness of similar nutrition-focused quality improvement programs targeting malnourished hospitalized patients in other integrated delivery networks. An area of particular interest would be to explore how this type of model translates into the postacute care space to confirm the impact of similar nutrition-focused quality improvement programs across the continuum of care. We wish to thank Scott Goates, PhD, for his critical review of this article, and Wendy Landow, MPH; Sarah Kozmic, BA; Jian Li, BA; Linlin Fan, MA; and Gretchen VanDerBosch, RD, for their assistance. 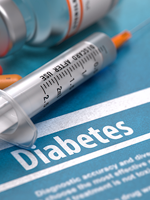 Portions of this study were presented at the International Society for Pharmacoeconomics and Outcomes Research Conference, May 2016, in Washington, DC, and at the Vizient Clinical Connections Summit, September 2016, in Dallas, TX. Financial support for the study was provided by Abbott Nutrition. Dr Sulo and Dr Partridge are stockholders of Abbott Nutrition/Laboratories. Mr Feldstein is a consultant to Advocate Health Care and received research support from Abbott Nutrition. Mr Schwander has conducted research for the Center for Applied Value Analysis and for Abbott Nutrition. Dr Sriram has received research support from Advocate Health Care and is on the Speaker’s Bureau of Abbott Nutrition. Dr Summerfelt reported no conflicts of interest. 1. Plsek PE, Greenhalgh T. Complexity science: the challenge of complexity in healthcare. BMJ. 2001;323:625-628. 2. Center for Value Based Medicine. Value-Based Medicine® analyses. www.valuebasedmedicine.com/wp-content/uploads/2013/01/value-based-medicine-descriptor.pdf. Accessed October 23, 2016. 3. Brown GC, Brown MM, Sharma S. Value-based medicine: evidence-based medicine and beyond. Ocul Immunol Inflamm. 2003;11:157-170. 4. Porter ME, Teisberg EO. Redefining Health Care: Creating Value-Based Competition on Results. Boston, MA: Harvard Business School Press; 2006. 5. Snider JT, Linthicum MT, Wu Y, et al. Economic burden of community-based disease-associated malnutrition in the United States. JPEN J Parenter Enteral Nutr. 2014;38(2 suppl):77S-85S. 6. Goates S, Du K, Braunschweig CA, Arensberg MB. Economic burden of disease-associated malnutrition at the state level. PLoS One. 2016;11:e0161833. 7. Weiss AJ, Fingar KR, Barrett ML, et al. Characteristics of hospital stays involving malnutrition, 2013. Healthcare Cost and Utilization Project statistical brief #210. September 2016. Agency for Healthcare Research and Quality; Rockville, MD. www.hcup-us.ahrq.gov/reports/statbriefs/sb210-Malnutrition-Hospital-Stays-2013.pdf. Accessed September 12, 2016. 8. Elia M, Normand C, Laviano A, Norman K. A systematic review of the cost and cost effectiveness of using standard oral nutritional supplements in community and care home settings. Clin Nutr. 2016;35:125-137. 9. Philipson TJ, Snider JT, Lakdawalla DN, et al. Impact of oral nutritional supplementation on hospital outcomes. Am J Manag Care. 2013;19:121-128. 10. Snider JT, Jena AB, Linthicum MT, et al. Effect of hospital use of oral nutritional supplementation on length of stay, hospital cost, and 30-day readmissions among Medicare patients with COPD. Chest. 2015;147:1477-1484. 11. Zhong Y, Cohen JT, Goates S, et al. The cost-effectiveness of oral nutrition supplementation for malnourished older hospital patients. Appl Health Econ Health Policy. 2017;15:75-83. 12. Meehan A, Loose C, Bell J, et al. Health system quality improvement: impact of prompt nutrition care on patient outcomes and health care costs. J Nurs Care Qual. 2016;31:217-223. 13. Walzer S, Droeschel D, Nuijten M, Chevrou-Séverac H. Health economics evidence for medical nutrition: are these interventions value for money in integrated care? Clinicoecon Outcomes Res. 2014;6:241-252. 14. Sriram K, Sulo S, VanDerBosch G, et al. A comprehensive nutrition-focused quality improvement program reduces 30-day readmissions and length of stay in hospitalized patients. JPEN J Parenter Enteral Nutr. 2017;41:384-391. 15. Ferguson M, Capra S, Bauer J, Banks M. Development of a valid and reliable malnutrition screening tool for adult acute hospital patients. Nutrition. 1999;15:458-464. 16. Coats KG, Morgan SL, Bartolucci AA, Weinsier RL. Hospital-associated malnutrition: a reevaluation 12 years later. J Am Diet Assoc. 1993;93:27-33. 17. Giner M, Laviano A, Meguid MM, Gleason JR. In 1995 a correlation between malnutrition and poor outcome in critically ill patients still exists. Nutrition. 1996;12:23-29. 18. Thomas DR, Zdrowski CD, Wilson MM, et al. Malnutrition in subacute care. Am J Clin Nutr. 2002;75:308-313. 19. Somanchi M, Tao X, Mullin GE. The facilitated early enteral and dietary management effectiveness trial in hospitalized patients with malnutrition. JPEN J Parenter Enteral Nutr. 2011;35:209-216. 20. Pfuntner A, Wier LM, Stocks C. Most frequent conditions in U.S. hospitals, 2011. Healthcare Cost and Utilization Project statistical brief #162. September 2013. Agency for Healthcare Research and Quality; Rockville, MD. www.hcup-us.ahrq.gov/reports/statbriefs/sb162.jsp. Accessed October 11, 2016. 21. Norman K, Pichard C, Lochs H, Pirlich M. Prognostic impact of disease-­related malnutrition. Clin Nutr. 2008;27:5-15. 22. Lim SL, Ong KC, Chan YH, et al. Malnutrition and its impact on cost of hospitalization, length of stay, readmission and 3-year mortality. Clin Nutr. 2012;31:345-350. 23. Bureau of Labor Statistics, US Department of Labor. May 2014 national occupational employment and wage estimates: United States. Occupational Employment Statistics. www.bls.gov/oes/2014/may/oes_nat.htm. Accessed July 21, 2015. 24. McWhirter JP, Pennington CR. Incidence and recognition of malnutrition in hospital. BMJ. 1994;308:945-948. 25. Neelemaat F, Bosmans JE, Thijs A, et al. Oral nutritional support in malnourished elderly decreases functional limitations with no extra costs. Clin Nutr. 2012;31:183-190. 26. Norman K, Pirlich M, Smoliner C, et al. Cost-effectiveness of a 3-month intervention with oral nutritional supplements in disease-related malnutrition: a randomised controlled pilot study. Eur J Clin Nutr. 2011;65:735-742. 27. Fingar KR, Weiss AJ, Barrett ML, et al. All-cause readmissions following hospital stays for patients with malnutrition, 2013. Healthcare Cost and Utilization Project statistical brief #218. December 2016. Agency for Healthcare Research and Quality; Rockville, MD. www.hcup-us.ahrq.gov/reports/statbriefs/sb218-Malnutrition-Readmissions-2013.pdf. Accessed January 3, 2017. 28. Centers for Medicare & Medicaid Services. What are the value-based programs? www.cms.gov/Medicare/Quality-Initiatives-Patient-Assessment-Instruments/Value-Based-Programs/Value-Based-Programs.html. Accessed November 9, 2016. PROVIDERS: Hospitalized patients present many challenges and opportunities for healthcare professionals to affect patient outcomes positively during inpatient care. The stress and pressure to perform above standards and to help patients can be overwhelming. Whether it is a surgical operation to remove cancerous cells, growths, or invading tumors, precision is necessary for surgeons and is vital for patients and their families. For nurses, providing patient-focused care can positively affect patients and their families. 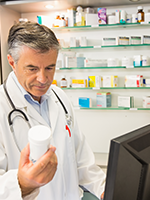 For pharmacists, precise delivery of the right drug at the right dose and time for the right patient is crucial for yielding the expected benefits. With each provider playing a pivotal role in a multidisciplinary setting and collectively providing expertise, it may be easy to assume that all is as it should be with regard to meeting the essential needs of the patient. But could adequate nutrition be an understated cause for concern? The novel study by Sulo and colleagues in this issue of the journal provides credible and excellently presented data and findings supporting nutritional interventions to improve health outcomes and dramatically reduce the costs of care for malnourished hospitalized patients.1 The utilization of their web-based budget impact model as a template for further comparative effectiveness research design and analyses, and the assessment of resource management in this fashion can only improve the care of patients in hospital milieus. In the executive summary to a United Kingdom National Health Service (NHS) white paper that was published in 2013, Robert Francis QC, who chaired the Mid Staffordshire NHS Foundation Trust Public Inquiry, suggested, “Develop and share ever improving means of measuring and understanding the performance of individual professionals, teams, units and provider organisations for the patients, the public, and all other stakeholders in the system.”7 The lack of proper nutrition for hospitalized patients was also a focus of this NHS white paper. 1. Sulo S, Feldstein J, Partridge J, et al. Budget impact of a comprehensive nutrition-focused quality improvement program for malnourished hospitalized patients. Am Health Drug Benefits. 2017;10(5):262-270. 2. Sriram K, Sulo S, VanDerBosch G, et al. A comprehensive nutrition-focused quality improvement program reduces 30-day readmissions and length of stay in hospitalized patients. JPEN J Parenter Enteral Nutr. 2017;41:384-391. 3. Maasberg S, Knappe-Drzikova B, Vonderbeck D, et al. Malnutrition predicts clinical outcome in patients with neuroendocrine neoplasia. Neuroendocrinology. 2017;104:11-25. 4. Yeh DD, Cropano C, Quraishi SA, et al. Implementation of an aggressive enteral nutrition protocol and the effect on clinical outcomes. Nutr Clin Pract. 2017;32:175-181. 5. Weimann A, Braga M, Carli F, et al. ESPEN guideline: clinical nutrition in surgery. Clin Nutr. 2017;36:623-650. 6. Zanini M, Bagnasco A, Aleo G, et al. Returning to the sacred – the importance of careful attention to patients’ nutritional needs in hospital settings. J Adv Nurs. 2017;73:523-526. 7. Mid Staffordshire NHS Foundation Trust. Report of the Mid Staffordshire NHS Foundation Trust Public Inquiry: Executive Summary. London, UK: The Stationery Office; February 2013. www.midstaffspublicinquiry.com/sites/default/files/report/Executive%20summary.pdf. Accessed July 11, 2017.